How Can Your Packaging Line Benefit From Automation? Automating a packaging line may seem like a daunting task, but with the availability of technology and benefits including improved efficiency and decreased costs, automation may be the right choice. The automation of various processes has become ubiquitous throughout the food industry. The food-packaging sector, in particular, has made great use of many technological advances and improvements in automated processes. With automated systems more available than ever, companies are quickly recognizing the benefits of automation and bringing processes into the modern era. For operations, such as packing, pick and place, sorting, labeling, and palletizing, automated systems can offer efficiency and cost savings. For some organizations — especially those that are smaller in size — bringing in automated systems represents a threat to employment and an elimination of jobs. However, automation is ideal for tasks that are tedious and repetitive in nature as well as for tasks workers will not or cannot do. Additionally, automation can be a critical tool for completing difficult tasks where frequent staff rotations are required. Some companies may be wary of pursuing automation due to the stigma of high cost associated with implementation, but with regular advancements and innovations, automated systems are more attainable than ever before. For example, only a few years ago, the cost of an automated palletizer could exceed $250,000, which places a reasonable return on investment (ROI) out of reach for many users. Today, many packaging-line installations come equipped with robotic palletizing at a cost nowhere near that of previous years. When compared with the cost of labor required to complete the same task — such as hoisting 50 pounds of product at a rate of 25 times per minute — it becomes clear that automated systems offer distinct advantages. 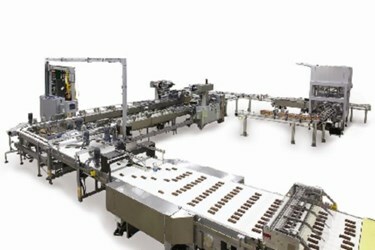 Aside from labor savings and increased operational efficiency, packaging-line automation offers more efficient use of space and improved layouts in the packaging facility. Additionally, automated systems offer high degrees of reliability, and as long a regular maintenance is performed, can have a long, useful life. Systems can be adapted for a variety of products and, in some cases, are even capable of changing their own tooling to meet the requirements of a certain task. When it comes time to determine if automation is the right choice for your packaging operations, consider facts, such as initial investment cost, operational costs, gains in efficiency and productivity, and long-term benefits.